Every year the procedure of nail extension with gel becoming more popular. This is due to the increased interest on the part of women who can not boast of natural beauty and health of nails. Capacity also helps to create an elegant manicure and makes the appearance of well groomed nails. First of all prepare your nails for the procedure. Cut them and use nail Polish well nail plate. This is to ensure that the gel is subsequently peeled off. Then apply on the treated nails the degreasing agent and leave for a few minutes, but not more than 5. Carefully pick up the artificial nails (nail tips) on each finger. Apply a drop of glue on the first tips and apply it to the nail. Press firmly and hold for a few seconds until the glue is dry. The same procedure guide for the rest of the nails. Make sure that the join does not appear bubbles, otherwise the manicure will not last for long. When all tips will be stuck, take tipareth and with his help, carefully cut them to length. Treat the tips of artificial nails with a nail file. Then open the bottle of gel and mix it with a brush. You need to prevent only the part of the gel that will be used during the procedure. Type in the brush a little gel and start applying it on the nail. Try to distribute it as evenly as possible, filling the space between the tips and the base of the nail, the surface is smooth. Put your hand under the UV lamp and wait a few moments until the gel solidifies. After building treat the nails with a special degreasing agent to remove the sticky layer remaining as a result of polymerization of the gel. This will help prevent small dents on the nail plate. It is possible to increase the nails on forms. To do this, apply a special stencil on the nail plate so that his window was under the edge of the nail. Top evenly apply the gel and dry it under the UV light. Then carefully remove the form. 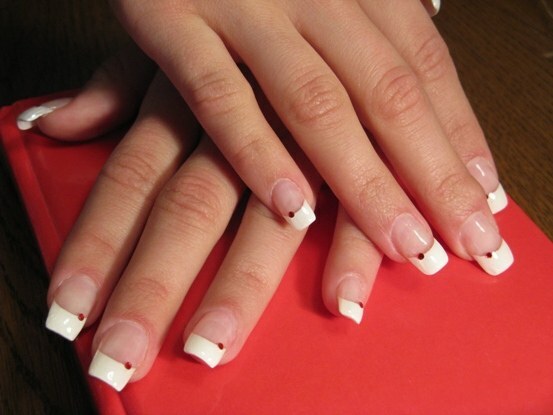 Your nails before this procedure should be long. Before doing the build yourself, go to a specialist manicure and will examine all the details of this process. Not to increase the nails, if you are taking hormonal or drugs, as this can begin peeling gel. To use the hand cream on the day of the hair extension is not recommended. If when building the nail turned out uneven, remove imperfections with the help of a nail file, apply a new layer of gel and degrease.